The Toyota C-HR has a distinctive design that causes people to talk for all the right reasons, no matter what the season. The C-HR was created with a race car driver approach. Its fit lower body sits atop available 18-in. wheels to help give this city cruiser one powerful stance. C-HR’s higher height and its steeply raked rear window work together to create a sporty, passenger-friendly cabin, as well as a uniquely distinct silhouette. Another standard gift are the projector-beam halogen headlights with unique cluster LED Daytime Running Lights, along with its cantilevered rear spoiler. Combined together, these features give the C-HR’s sharp and edgy look and feel. Inside, are comfortable front bucket seats that feature deep bolsters to help cradle you in the corners. Under the hood, a 2.0-liter 4-cylinder engine gives you 144 horsepower to play with, giving you the hustle you need to get to your next favorite spot. Throw in a sport-tuned suspension and Continuously Variable Transmission with intelligence and Shift Mode for extra features. 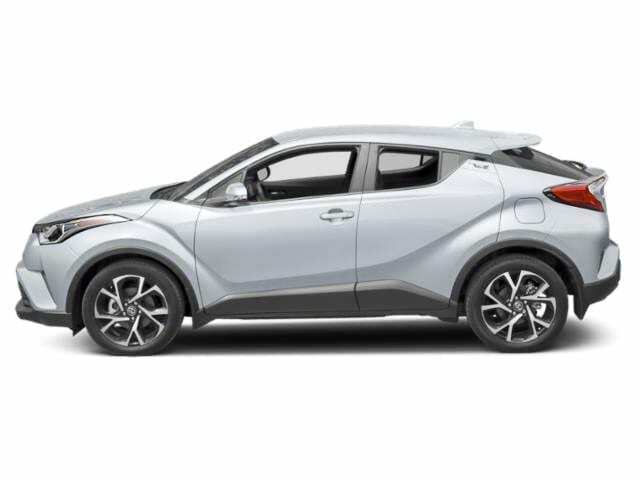 Toyota C-HR’s distinctive exterior extends inward to its sleek interior texture. Once inside, its more than obvious that this is a car for those who are passionate about being behind the wheel. The interior, which features available leather-trimmed seats, a leather-trimmed steering wheel and standard satin-plated shift knob, is totally intuitive and further showcases C-HR’s focus on style. Another standard is the Electric Parking Brake with Brake Hold. You can use the toggle switch to manually activate Toyota C-HR’s standard Electric Parking Brake or set it to automatically engage/ release the parking brake as you park. This system also includes the convenient Brake Hold feature. Turn it on with the push of a button, and when your foot is on the brake pedal and the vehicle is fully stopped, the feature holds the brake until you press on the accelerator. Standard 60/40 split rear seats Toyota C-HR’s rear hatch opens up to reveal plenty cargo space.